Join us for the reinventing the classroom conference! The conference will feature presentations by educators from around the world. My presentation will be on Thursday May1st. This is one of several global online conferences that are completely organized by and for educators from around the world. It is both an impressive use of social media for professional development, and of teachers taking charge of our own growth. Be sure to follow the hashtag for the event! 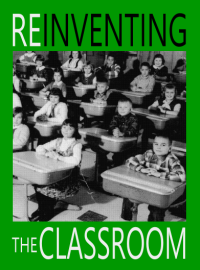 For more information, or to register visit Reinventing the Classroom. This session will cover all the basic topics needed to start collaborating across networks and developing proficiency with the tools of technology. As a classroom teacher, you cannot create your own educational system. However, you can change what is going on in your classroom. This session will show you how to help your students become connected leaners. Teaching without textbooks, facilitates learning in a student-centered environment. It is a way to make students’ voice count. Student participation means letting the students make the important decisions, like what to learn and how to learn it. This session will explain how to use Skype and Twitter and also how students’ blogs can be used to get in contact with students and teachers from other parts of the world. Questions and challenges are set by the students with help from the teacher. Students offer feedback to fellow students. The goal is self-paced differentiated learning where every student can progress individually and the teacher can keep track of this. Technology makes it possible to learn in an authentic real-world practice, modelling real-world problems. Dette er definitivt verd å bruke noen timer av 1. mai til! Dette er definitivt verd å bruke noen timer av 1. mail til! Takk! Håper å se deg der! Er påmeldt og kommer til å følge med på nettet. Good information. have More stuff about Things should know before teaching English to share.